A few months ago, as part of my recuperation and recovery training I went for it and bought a new turbo training, a Wahoo Kickr, complete with matt and stand bundle. Having signed up to Sufferfest, which I love, I have continually been intrigued with Zwift. Shall I, shan’t I…eventually I thought – I have all the gear, barely no idea so go for it. After signing up and having a 2 week trial I spent this time riding solo, trying to get to grips with the virtual cycling world. Getting used the app on my iPad Pro was easy, but wow…getting my head around the Kickr and Zwift working in tandem certainly took me a few rides. I just couldn’t believe how well it worked. Up hills it get’s tough, the ease of picking up speed downhill means I speed along like Ben and JB. But the unique feature for me…you can nip into the slipstream of the rider in front and feel the benefits…just as you do on the road. Crazy! The next step was trying to participate in an event. After all, the uniqueness of Zwift is being able to ride with likeminded people from around the world, getting involved in the community aspect is key. After much research, and finding out that based on the Zwift categorisation I sit firmly in class D, (there’s far to many speedy, powerful and downright awesome riders in A-C, I’ll leave that to Graham and Nobby) I opted for a ride with a group called PACK. 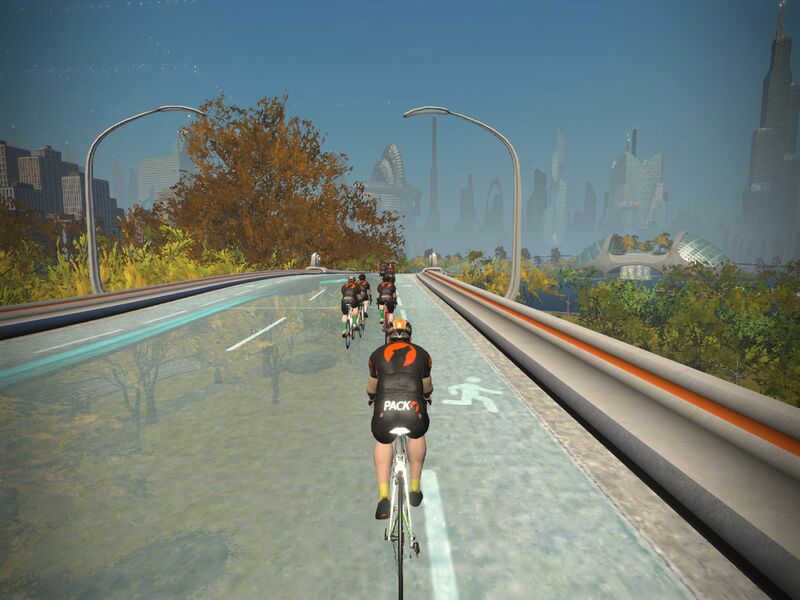 This group is for all who ride the Zwift Social Group Rides (PACK) on Saturday, Tuesday, Wednesday and Thursdays, with the objective of riding together. My first session with them was interesting. I was genuinely quite apprehensive as the clock counted down to ‘the off’, with more and more riders joining – over 320 on this ride. Bluntly – it was superb…well it was for the 30 minutes or so I was on the ride with them, as my broadband connection dropped and I was then cycling alone, lost and trying to figure out what to do next. I finished the ride. I then booked on for a ride around New York on Thursday. Brilliant ride, great route and super tired at the end. A great bunch of ‘virtual’ riders, that keep pushing each other forward, whilst staying in the group. 1,500 feet of climbing in 59 minutes, with an average speed of 18.1mph. The previous Zwift ride was 21.1mph – way faster than I ever do on the road, so it will be interesting to see how training develops during the winter, then transfers to the road in Spring.